Modifiable versions of standard parent letters etc. discharge planners, and other information and referral professionals. Seventy-five percent of SBHCs have a mental health provider. In studies of SBHC service utilization, mental health counseling is repeatedly identified as the leading reason for visits by students. One 1998 study found that adolescents who had access to SBHCs were ten times more likely to make a mental health or substance abuse visit than those without access to an SBHC. In one study, inner-city students were 21 times more likely to make mental-health related visits to SBHCs than to community health centers. A national survey of SBHCs found the following mental health and counseling services are provided at SBHCs where mental health professionals are included as center staff: crisis intervention, mental health assessment, grief and loss therapy, substance use therapy, mediation, and others. 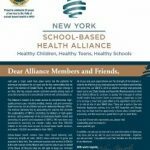 School-based health centers offer high quality mental health care by using an integrated strategy for addressing health and mental health issues. 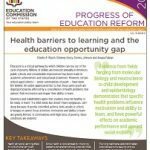 Several studies have shown that the barriers experienced in traditional mental health settings – stigma, non-compliance, inadequate access – are overcome in school-based settings. 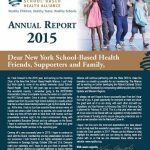 One study found that students served by SBHCs had fewer discipline problems, course failures, and school absences.